Editor’s Note: Lawrence Jeppson is traveling and was not able to submit a column this week. He asked us to rerun an old favorite, and we selected this one from July 8, 2013. We hope you enjoy this one, and look forward to Lawrence’s return. More than any other collector, Victor Rosso had a burning passion for art. Although his flaming glory burned the brightest in the near Westside of Midtown Manhattan, his career as a painter and collector took off when he was known as Vittorio Rosso in Buenos Aires, Argentina. When Vittorio took up lodging in Widow Horne’s drabby boardinghouse he was suave and lively and seemed to have a great deal of money. His Italian-born parents had dispatched him back to Italy when he was ten. He studied art in Turin and Rome. He was 22 when he returned to Argentina in 1920, living in Cordoba and Rosario before moving to Buenos Aires. In Cordoba Vittorio, 26, painted two portraits of a prominent citizen, submitted a bill for 30,000 pesos ($12,000 at the time), didn’t like it when the sitter said the fee was outrageous, took the case to court, and received half that. He regaled Widow Horne’s boarders with an anthology of tales. He painted the portrait of Pope Benedict XV, which was hanging in the opulent Papal quarters. He received a traveling fellowship that enabled him to study and paint in the capitals of Europe. He was made a Knight of the Order of Jerusalem and won certificates, first prizes, and gold medals left and right. Around the dining table, he claimed he painted the largest portrait of National Hero General José San Martin ever executed. It was hanging regally in the Argentine Parliament. His accomplishments seemed neverending. In January, 1927 tragedy struck. His studio, crammed with finished canvases and works in progress, was destroyed by fire, taking everything the artist owned. Fortunately, he carried insurance totaling 78,000 pesos ($32,000). After being paid off he held a jubilant, epicurean supper and was photographed holding a check for 50,700 pesos. He gave a copy of the photo to a friend from the boardinghouse. The friend happened to work for a bank, and he put the photo in the bank’s Rosso file, where later it was uncovered. Although he didn’t go on a spending spree with his new wealth, Vittorio was so outlandishly dynamic that eleven months after the fire he won heart and hand of the widow’s daughter, Laura Horne, who was four years younger and a crack secretary for Standard Oil. 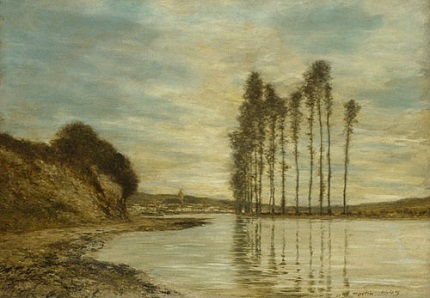 Vittorio, a portrait painter, began filling his new studio with landscapes. In a 1927 issue of The Ladies’ Home Journal he found a three-color reproduction of Homer Dodge Martin’s View on the Seine, which he reproduced. It had been hanging serenely in the Metropolitan Museum of Art for 37 years. 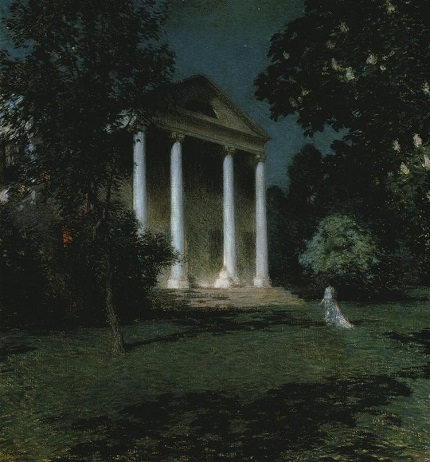 From a later issue he clipped a reproduction of Willard Metcalf’s May Night from Washington’s Corcoran Gallery. Homer Dodge Martin, View of the Seine, Metropolitan Museum of Art. The fake Rosso painted of this picture was destroyed in the fire. He began painting replicas from a boxful of postcards from many museums depicting paintings by minor artists. The collection grew and grew and needed frames. He haggled for a purchase of 150 frames. After their delivery, Vittorio complained some didn’t fit. Three months after their marriage, the Rossos went down to the rat-infested harbor of Buenos Aires and stole aboard the Pan American headed for New York. No one knew where they had gone. The framer, and others, had not been paid. At U.S. Customs and Emigration they swore they had lived at an address in Cordoba, Argentina. Unloaded from the steamship, Rosso’s collection of paintings and antique furniture filled fourteen very large crates, whose value the owner did his best to minimize, since he would have to pay an ad valorem duty. The custom’s appraised valued the whole at only $5,000, which pleased Rosso. They opened a bank account with a $27,000 deposit. Rosso and his bride rented an apartment at 230 West End Ave. and the fourth floor of a loft building at 11 West 56th St. for a studio, where he could paint his own work and sell the masterpieces they had brought from home. The leases were signed by Laura. Various manufacturers and a dealer in ladies’ undergarments occupied other floors, with a Chinese tearoom at the street level. A manned elevator connected the floors during business hours; at other times it was operated by tenants. The Rossos set about decorating the studio with cheap wall fabrics to show off the art. They created two Turkish divans made from three mattresses, which had to be carried by hand up four flights of stairs, piled up like rectangular pancakes. They covered them with cheap copper-colored damask. Victor, as he now called himself, had the mattresses and cushions filled not with conventional horsehair, wool, or cotton but with cheap straw and excelsior. Victor and Laura reinvented their backgrounds, erasing Buenos Aires from their histories. They had lived and courted in Cordoba, near where her bachelor uncle, Harold Godbear, had a big ranch, “El Caballito” (by coincidence the name of a Buenos Aires subway station Laura passed everyday going to work). Uncle Harold was a voracious art collector, going three times a year to Europe to make his purchases. Following a doctor-ordered trip across the South Atlantic to Capetown he contracted pneumonia and died. Laura inherited the art, the huge collection now stacked or hanging in the New York studio. To protect such valuable assets, Victor began talking with insurance companies. Laura typed out a list of 157 oil paintings plus antiques and other furnishings. Her values for the paintings ranged from $550 to $8,500, with an average of $1,700. The total for everything, $226,130. All the way from Argentina to the studio, none of this had ever been insured. The insurance broker who went through the premises was impressed by the size of the collection and seduced by the charm of the owners. He recommended policies with two companies, who sent Ernest Root to inspect the building and interview Laura Rosso. All but one of the 157 paintings were Victor’s fakes. He had been clever enough not to imitate Van Gogh, Gauguin, Monet, or anyone famous, artists whose work might be recognized by even the most untutored insurance inspector. Instead, Victor had concentrated on lesser artists, many of them run-of-the-mill academic painters. No, Laura told Root, she had never collected any money from a fire-insurance company. Neither of them had ever had any fire in the United States or anywhere else they had lived. Three weeks later Laura received two insurance policies totaling $226,130. Victor quickly paid the $3,623.22 premium. Laura wrote the presidents of both companies to make sure the policies were in force. On an early Sunday morning in October, 1930, a fire broke out in the studio. Policemen and firemen were quickly on the scene. Fire marshals soon followed. Everything was destroyed except a single painting! No one knew how to locate the Rossos. They did not learn of their loss until Sunday night. By then the marshals were suspecting arson. Victor and Laura were questioned and wrote out statements. Laura filed insurance claims. The insurance companies put crack investigators on the case — in New York, Argentina, Italy, England, South Africa. Italy wired that all Victor’s claims were spurious. Argentina revealed Vittorio’s previous fire and the truth about art-collecting Uncle Harold. He did not die at 65 in South Africa but had been shot and killed in a longshoremen’s brawl in Liverpool at the ripe age of 16! Victor claimed that he had really purchased the paintings at auctions and thought the Uncle Harold story would help him sell them. The Rossos were tried for arson. After eight hours of jury deliberation, she was acquitted, he was convicted. He was severely reprimanded by the judge and sentenced to prison. Laura had not started the fire. The jury had decided that. Laura had taken out the insurance. So Laura sued the insurance companies for the loss of the paintings. Willard Metcalf, May Night, Corcoran Gallery of Art, Washington, D.C. Rosso’s counterfeit of this painting was among those destroyed by the fire. Her suit was filed in 1931 but did not come to trial until 1934. By then insurance investigators had completed a meticulous analysis of the postcards and clippings found in the Rosso apartment, comparing them with the list of paintings destroyed. It was obvious Rosso had created his collection by copying the postcards and other sources. As far as is known, Victor Rosso never sold a single forgery. He intended to make his fortune through quantity and not quality, and he intended to do so through a single sale — a fire sale!